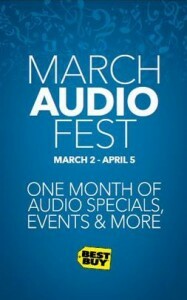 #AudioFest 2014 Happening @ Best Buy Now!! It’s just about that time of the year when the cold, harsh winter weather is replaced with sunshine, the trees start to blossom, shorts or skirts can be worn regularly, and when you can smell the delectable scent coming from your neighbors BBQ fresh off the grill. As if it couldn’t come soon enough, Spring is almost finally here! I literally can’t wait to sit out at the pool or around a campfire with a bunch of my closest friends listening to our favorite music. With advancements in technology, downloading music and creating playlists has never been easier. But here is the important part: how do you plan to listen to all this great music without having a quality product that produces top notch sound? Maybe it’s time to throw away those old headphones and CD player and upgrade your audio. Visit your local Best Buy store to check these Audio products and more such as the JBL Flip Portable Stereo Speaker for most Bluetooth-enabled devices. This JBL speaker has two 40-millimeter drivers and a built-in bass port, it delivers full-range JBL® sound with exceptional bass – all in a portable package. It also features the following: an integrated microphone and call answer button so you can answer calls without skipping a beat; digital signal processing which generates impressive, room-filling sound; built-in lithium-ion battery that offers up to 5 hours of audio playback per charge for extended use; headphone output so you will have no problem listening to music privately; and an outdoor design ideal for any environment. So whether you want to listen to music while your out at the pool or take it with you on a hiking trip, this durable and portable speaker gets the job done. The Bluetooth connectivity allows you to stream your favorite music through most Bluetooth-enabled devices. Don’t procrastinate or hesitate any longer!! Best Buy has the best selection of audio products – come in and let Best Buy teach you how to upgrade your sound so you can hear the difference and bring the noise!